Pioneers in the industry, we offer chemo copper bonded earthing electrode, copper bonded electrode, cu coated chemo earthing electrode and copper cladding bonding earth rod from India. 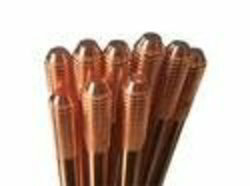 We are the prominent manufacturers, supplier and exporter of Maintenance Free Earthing Copper Rod. Earthing Rod mild steel copper bonded maintenance free earthing. Earthing Rod, Copper Bonded Rods, Copper Grounding Rods, Ground Rods. Owing to the fine raw materials used in its making, the offered Maintenance Free Earthing Electrode is one of the best in its league. Manufactured as per the set industrial norms, the quality of these electrodes is always maintained. 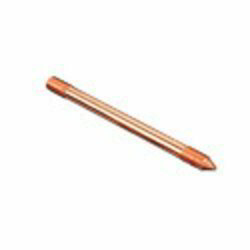 This copper earthing electrode is known for its high resistance to corrosion and high conductivity and made available by us at reasonable rates. Earthing Electrodes, Chemical Earthing Electrode, Gel Earthing Electrodes, Earthing Equipment.